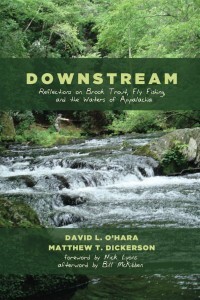 (2018) The subject matter of these pages (and of these books) is trout, fly fishing, ecology, and especially the intersection of the three. Matthew Dickerson is a Professor of Computer Science, and an affiliate of the Program of Environmental Studies at Middlebury College in Vermont. He is Director Emeritus of the New England Young Writers Conference in Vermont. 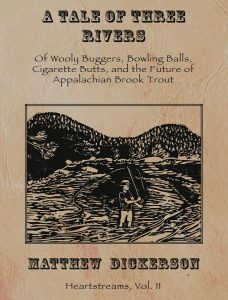 In addition to his writing about trout, fly-fishing, and ecology, his other published books include the medieval historical novel The Rood and the Torc and the fantasy novel The Gifted. David O’Hara is an Associate Professor of Philosophy at Augustana College in Sioux Falls, South Dakota. His previous books co-authored with Dickerson also include Narnia and the Fields of Arbol: the Environmental Vision of C.S.Lewis (University Press of Kentucky, 2009) and From Homer to Harry Potter: a Handbook of Myth and Fantasy (Brazos Press, 2006). Middlebury College undergraduate students Kelly March and Connor Wood (class of 2011), worked with Matthew Dickerson in January of 2009 doing research for Downstream in Tennessee, Georgia, and Vermont. Middlebury College undergraduate students Robert Seltzer and Gregory Woolston created the maps for Downstream. Kristin Richards, Middlebury class of 2017 created this website in the Summer of 2014.